Brian Madden's LinkedIn photo. Not only is he fiercely technical, but also very funny. You'll be missed in VDI-land, Brian! The world of VDI will never be the same. 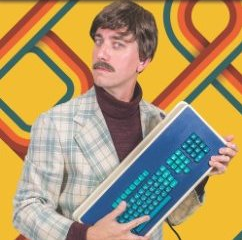 Beloved VDI (and pinball) wizard Brian Madden is departing TechTarget, leaving behind his namesake website. For the past decade-plus, brianmadden.com has been the canonical resource for IT folks seeking enlightenment about desktop virtualization and a host of other IT topics. Brian's departure is the end of an era. Last week, he did the 120th, and likely second-to-last, episode of his podcast, and we were thrilled to have ExtraHop engineer and longtime Citrix Technology Professional John Smith as a featured guest on the episode. Brian and John have known each other for years, so what started out as a "sponsored podcast where we talk about ExtraHop for an hour" turned into a very crunchy conversation between four guys (Jack Madden and Gabe Knuth are also featured) who know a combined metric kiloton about VDI. Great stuff! A quick pitch: ExtraHop is at the last Briforum ever right now, so if you liked this podcast, stop by and meet us at booth #112 to get more expert insight on how to get better visibility and security in your environment with ExtraHop.